Bronze Bod Custom Airbrush Spray Tanning exclusively uses Infinity Sun Products and is Exclusive to the Des Moines Metro Area! Infinity Sun is the most elite spray tanning product on the market. 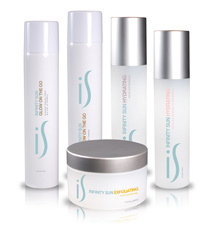 You will find Infinity Sun products on many Hollywood Stars, in magazines, and on beauty blogs! Infinity Sun is known as the brand that celebrities prefer! Infinity Sun can be seen on E! Network, in Radar Online, Glamour Magazine, Vogue Magazine, and O Magazine. There's no secret we want the best for all of our bronzed beauties! We do just that with our Infinity Sun equipment! Our Spa-Lite Machine, made by Infinity Sun allows us to adjust the color that best fits the client. With 30 levels of color, we can match any skin tone! This allows us to create an all over, even application in just 15 minutes! The image to the right is our Mist Removal Machine that keeps the air clean and clear as you're getting beautifully bronzed 99.9% overspray Free! We take pride in providing our client’s with the best products in the sunless tanning industry! Keep it simple! Even out your complexion with just a little pop of color. A spray tan can be just like make up; making you look put together! They don't have to be dark, we have over 30 shades to choose from! We want you to feel confident and comfortable in your own skin! Plan a Girl’s Night In, Pre-Bachelorette & Pre Wedding Tanning Night! Special pricing for Bridal Parties! Are you competing in a Fitness Competition? Let us assist you in contouring your tan along with using the Rapid Dry Ultra Dark Bronzer! Bronzer develops within 2-4 hours! You will make others envy your deep dark spray tan that will enhance and highlight your muscle tone! Make your tan last longer with Infinity Sun's at home products! We have all Infinity Sun products in stock and ready to be taken home with you! Pick up Glow on the Go to touch up areas in between your next appointment! All products are made with organic ingredients and are hypoallergenic.